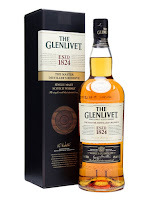 Dave's Whisky Reviews: Glenlivet Reviews: Founder's Reserve, Master Distiller's Reserve, 12, 15, 18 & 25! 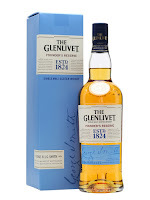 Glenlivet Reviews: Founder's Reserve, Master Distiller's Reserve, 12, 15, 18 & 25! Got a large multi-review dump today! 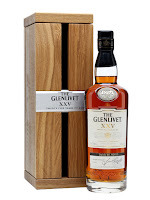 I realised just a minute ago, that I haven’t reviewed any Glenlivet on here, or Glenfiddich for that matter but we’ll move to them later maybe. 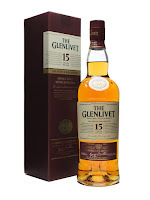 So today I thought I’d share my thoughts on one of the worlds most recognised Scotch brands, The Glenlivet. 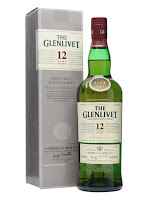 The 12 is seen as a really good entry level and could well have been my first proper single malt, although it was actually Dufftown 12. 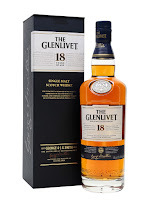 The 18 can be really good value for money but generally I find Glenlivet an easy drinking whisky for the masses. Nose: Young, fruity light esters- Lemon, apple juice, a little lime juice, light pastry note- Light strudel. Taste: Very light arrival, lemon zest, lemon peel, lemon sherbet, apple juice, pear. A bit of pastry developing. Finish: Short/medium length. Zesty lemon peel and sherbet, a little burnt plastic afterwards. A mark or two lower than the Master Distiller's Reserve but very similar profile. As I said easy drinking for the masses, not bad, not great. Nose: Light and clean but a little watery. Instantly pear drops, lots of them, young spritely esters, light artificial apple, apple juice. Taste: Spirity and fizzy with sour- Lemon sherbet, pear drops, apple fizz, melon, a little chocolate malt. Finish: Short length. Apple and lemon fizz. Young and estery but I prefer this to the 12yo. Nose: Fruit, chocolate, flowery, vanilla, caramel, quite acidic. Taste: Peaches and cream, vanilla, plums, bit of apple, drying malt. Flowery and herbal notes too. Finish: Short length. Flowery with lavender and drying malt. Tasted this years ago and haven’t gone back since. Really my benchmark for whisky I don’t like and don’t want to go back to. My fiancée thought vomit on the nose... Possibly a bad bottle? Nose: Lots of light fruity pear and some apple. Stewed apple, loads of pear drops. Light wood but the pear is quite overpowering. Perfume note, rosewater, hard candy. Taste: Very, very light. Perfumed and smooth, fruity suggestions of apple and creamy pear, maybe some apple pie and malt. Finish: Short length. Slips away with a hint of perfumed spice. Subtle influence from the new French oak, a very floral one. Nose: Bit of heat at first, oak, vanilla, toffee, apple, pear, grape, bit of maltiness, bit of spice- Cinnamon. Quite bourbon-y. Water: More fruit- Lots more sherry influence- Soft raisins, some tannins, more floral- Petals and blossom. Some mint, a wisp of smoke? Lovely citrus notes develop- Lemon, lime, juicy oranges, breakfast tea. Taste: Bit of rough heat, spice, maltiness and oak, constrained fruit- Oranges. Water: No heat, loads more fruit- Oranges and apples. Honey, toffee, vanilla, spearmint, floral, spice developing. Quite balanced. More water- Some citrus. Finish: Short/Medium length. Oak and spice fade quickly. With water: Balanced oak fades more slowly. A drop of water improves this a LOT, really delicious nose. I managed to get this at a French supermarket for £30 which is really good value for an 18yo. Nose: Fresh fruity Sherry, vanilla, caramel, Bourbon. Taste: Soft, very sweet Sherry, quite oaky, a little too oaky into the finish. Finish: Medium/Long length. Bourbon style with oaky wood planks. A little too oaky really, which is a shame as I was expecting this to be really good. Just had a look at Whisky Exchange, who say this has been finished in Sherry casks. Well, that’s about it. All the Glenlivet’s I’ve tasted so far. To me, it’s not something I seek out, in fact it’s normally something I avoid. But keep in mind, I generally prefer heavy, intense whiskies rather than light ones. Glenfiddich up next, maybe in two parts.